OHSAS 18001:2007 is the British Standard for Occupational Health and Safety Management Systems (BS OHSAS) followed by industries around the world to provide flawless safety and health measures for the welfare of workers. The London-based International Register of Certificated Auditors (IRCA) certifies the Lead Auditor Course, which is being offered through affiliated centres spread across the world. Green World Group in Kolkata is one among the centres which offers OHSAS Lead Auditor Course for career-oriented students and working people who wish to work as Lead Auditors in organizations. Candidates undergoing OHSAS 18001 Lead Auditor course at Green World Group in Kolkata are offered risk-related and industry-oriented practical and theoretical training sessions to groom them as talented auditors with advanced auditing techniques, key competencies in managing, planning audit processes, handling different kinds of clients and ability to resolve conflicts during auditing. 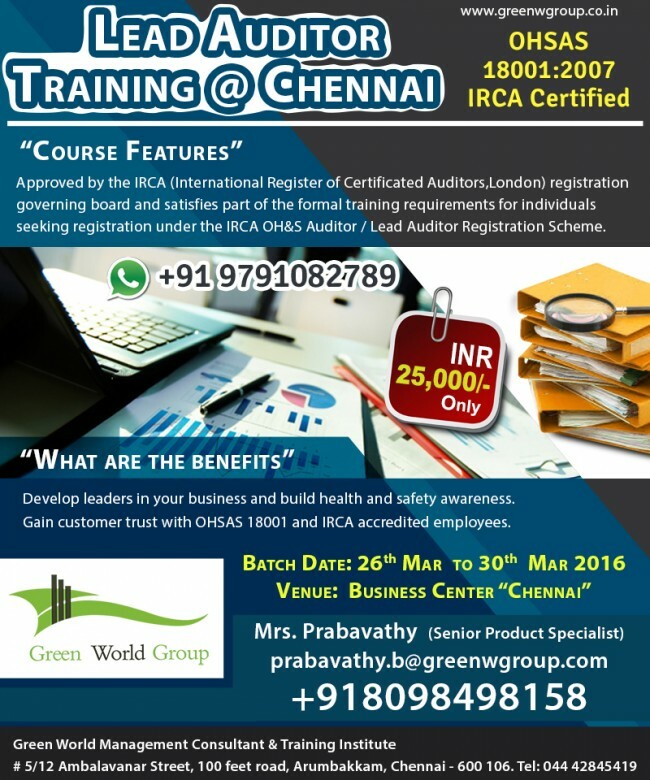 Also, the course fulfils part of the training required to get recognized under IRCA OH&S Auditor/Lead Auditor Registration Scheme. The course tests the competency level of the participants on the basic understanding they have on OHSAS 18001 standards and awareness on Occupational Health and Safety Management System (OHSMS) auditing standards following OHSAS 18001 principles. Those who are joining as freshers should take up IRCA2121 foundation course first before graduating for this course. People, who aspire to become Lead Assessors or third party assessors, those who are doing audits of supplies or those who wish to implement internal audits and audit programs can join this course. By doing this course, candidates can improvise their confidence and skill sets for effective auditing process. Those who have certification get instant recognition from employers around the world and can work as Lead Auditors in any occupational conditions. Join Green World Group Kolkata centre for IRCA accredited OHSAS 18001 Lead Auditor Course which has hosts of benefits. The next batch in Kolkata commences on November 23, 2015. Enroll now and be the early one to reap the benefits!